This disc contains all of Martinů’s piano trios, one pair of works from the 1930s and another from the 1950s. It serves as a good introduction to the music of the great Slavic neoclassicist. The musicians are the most recent iteration of the Smetana Trio, founded in 1934 by Josef Páleníček, father of the current cellist, Jan. Jiří Vodička is concertmaster of the Czech Philharmonic, and pianist Jitka Čechová recently completed eight discs of Smetana piano works for Supraphon. Admirers of Martinů sometimes wonder why his music is not more often performed. One reason that he remains on the edge of the canon is that he spent most of his career in exile. He wrote two of these pieces in France, and two in the United States of America. Some believe that the fertile Martinů simply wrote too much music, with around four hundred compositions. 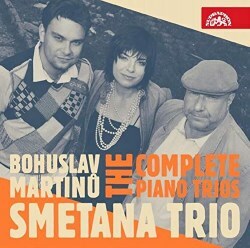 But these trios are all of high quality, making this listener want more, not less Martinů. The 1930 Piano Trio No. 1 (“Cinq pièces brèves”) is a series of short movements which might be called lapidary, if they were not so percussive and rhythmic. They are busy, like much neoclassical music of late 1920s, and while they exhibit the rhythmic energy of later works, only the fourth movement has a characteristic Martinů sound. The Bergerettes of 1939 offer another set of five short movements. But here are the distinctive open harmonies and swinging melodies, the syncopations, busy figurations, ostinatos, and lyrical tunes emerging from misty beginnings that make Martinů distinctive. These calming, upbeat pastoral pieces may seem at odds with the anxieties of pre-war Europe, but Martinů addressed these in the disquieting Double Concerto of 1938 and the Field Mass of 1939. Martinů wrote the Piano Trio No. 2 for the inauguration of the M.I.T. Hayden Library in 1950. Along with Piano Trio No. 3 of the following year, it joins a feeling of lightness and celebration to classical forms and proportions. They are both more lyrical and more serious than the trios from Paris. The only other recording containing all of Martinů’s piano trios is by the Trio des Iscles (Grave GRCD4), which is not competitive with the Smetana Trio. The French players race through all four pieces. They seem manic and shallow, while the Smetana Trio is thoughtful and unruffled. Appropriate tempi enable sharper rhythms to emerge, with great power. The result is exciting rather than superficial. The Smetana plays these pieces like the great music they are.